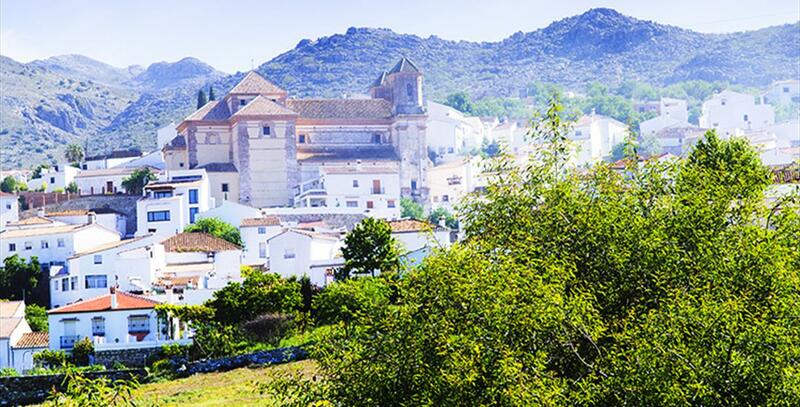 Ringed by the stunning scenery of the Genal Valley in the Serranía de Ronda, is Alpandeire, a small village with a population of just 270. 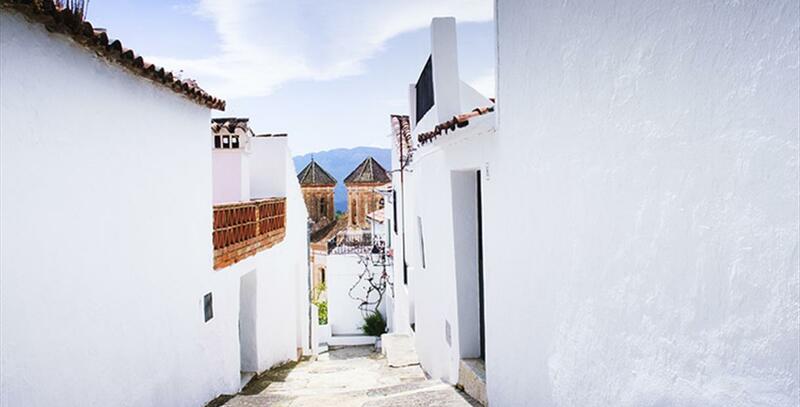 The village is laid out in the Arabic fashion, forming a maze of narrow streets, a classic example of Andalusian folk architecture. Alpandeire is the birthplace of the famed Catholic preacher Fray Leopoldo. 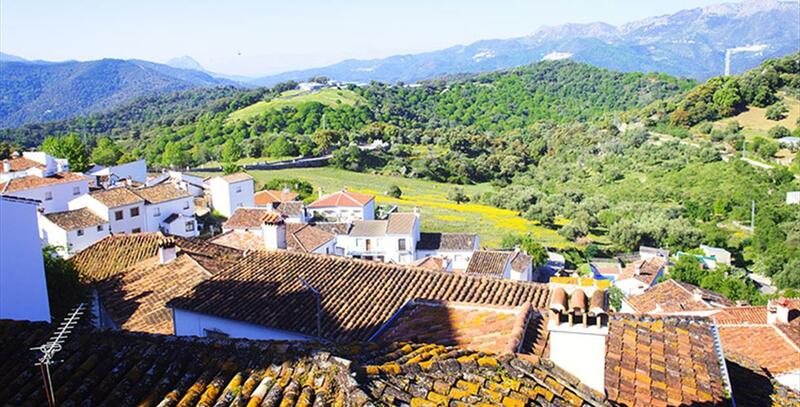 Lying at the foot of the Sierra de Jarastepar, it is the ideal environment for fans of nature and hiking. Two routes lead from Alpandeire to the villages of Atajate, Faraján and several natural parks. One of the must-see sights in Alpandeire is Fray Leopoldo's House. Born and bred in this town, this Capuchin monk was famous for his charity work and dedicated his life to serving the poor. The house in which he was born has been converted into a monument of historical and artistic importance and features many of his personal belongings. There is also a bronze statue erected in his honour and vantage point named after him, where one can also see another stature of Fray Leopoldo with a child in his arms. You can also follow the footsteps of the Fray Leopoldo along a trail that goes from Alpandeire and winds its way through a series of towns and villages in the Serrania de Ronda, including Pujerra, Igualeja, Cartajima, Júzcar and Farajan, all places where he walked until he entered the Capuchin order at the age of 33. Another monument of interest is the Antiguo Pósito - the Old Granary - built in the 17th century in the centre of Alpandeire, today a cultural centre. Also in the municipal area is a series of dolmens called the Encinas Borrachas (literally, the "Drunken Oaks"). These megaliths form a prehistoric gravesite where archaeologists have uncovered the remains of five individuals. In the centre of Alpandeire is the most famous of all its sights, the Church of San Antonio de Padua. It is popularly known as the "Cathedral of the Serrania" thanks to its impressive size compared with the rest of the buildings in the town centre. Originally built in the 16th century, its current appearance owes more to the rebuilding two centuries later. Its floor plan is in the form of a basilica, composed of three naves and two octagonal bell towers crowned with pyramid-shaped roofs. In the vault is an old cemetery in which lie two intact, embalmed bodies - according to popular tradition, that is - of a married couple who contributed funds to pay for the church's construction. To reach Alpandeire from Malaga, take the A-357. Passing through Ardales, between the reservoirs of Conde del Guadalhorce and Guadalteba, take the turn-off for the A-367, in the direction of Ronda. From there you continue along the A-397, which links up with the A-369. The A-369 main road connects with the MA-515, which takes you to Alpandeire. The total journey is 120 kilometres. Between the Sierra de Jarastepar and the valley of the River Genal, Alpandeire offers the visitor its rocky scenery, spectacular vantage points, streams and lush green vegetation. We invite you to discover the diversity of the landscape from north to south of the municipality by following its eleven walking trails and many places of natural beauty. The gorges of the Canalizo and the Infiernillo, where the Laza stream has its source, the Cerro de los Frailes and the Chorreón, a 50 metre-high waterfall, are just some of the natural wonders that you can discover if adventure is your thing. 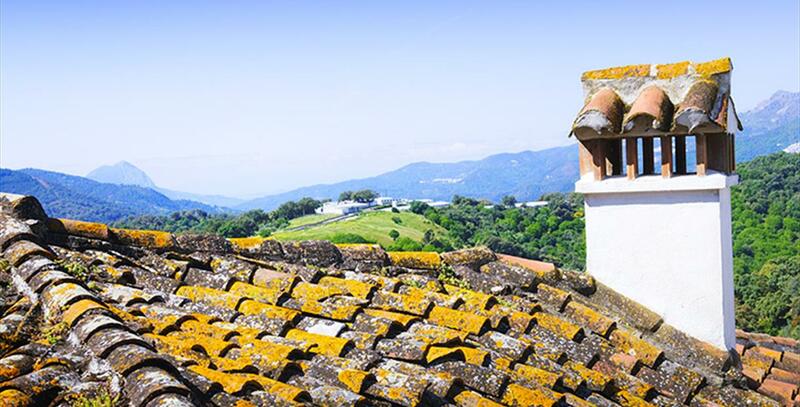 From the Encinas Borrachas mountain pass, you can take in the view of the Genal and Guadiaro rivervalleys. Other peaks that will take your breath away are the summits known as the Carnero, Poancón and Jarastepar. Alpandeire is also situated on the Gran Senda de Málaga (Great Malaga Trail). Stage 5 takes the visitor to Alpandeire from Benaluría, and from there stage 6 leads to the town of Ronda. The section of the trail to Ronda is long and arduous, and takes some 7 hours. It stretches for 18 kilometres and winds its way up and down steep mountain slopes and through mountain passes. The best time of year to see Alpandeire is during the summer fiestas. The 16th of August is the day of its patron saint, San Roque and is celebrated with a series of festive events. As well as the procession through the town, there is a lively dance in the evening, featuring traditional Rondeño and Serrana singing and local dances. - Easter Sunday: this day coincides with the ritual of "El Niño del Huerto", organized by the stewards, who are elected by secret ballot. The tradition is that an image of the baby Jesus is placed in the town square of Alpandeire in the morning, in order that the procession of the Virgin can set off in the evening to find him. Finally, Judas is burnt in effigy. - 24 June: to commemorate the anniversary of the birth of Fray Leopoldo, the townspeople of Alpandeire pay tribute to him with both religious and entertaining events. Fray Leopoldo is also remembered at Christmas time with festive events in his honour. - 7 October: similar to the festival of San Roque, in October it is the turn of the Virgen del Rosario - the Blessed Virgin of the Rosary. The characteristic gastronomy of Alpandeire follows the tradition of the Serrana region by matching the dishes to the seasons. These include rabbit with crushed garlic, lamb in tomato sauce, hot gazpacho soup in winter (a thick tomato soup with other vegetables, sometimes accompanied with potatoes or oranges) and cold gazpacho in summer (the classic soup with tomatoes, cucumbers, red peppers, garlic and olive oil). Desserts and pastries to a large extent follow the traditions of the Moors who used to inhabit the region. Among the home-baked confectionery made during Holy Week, the stand-outs are: pestiños (a kind of doughnut made with wheat flour, fried in olive oil and drizzled with honey), borrachuelos (sweet fried pastries with a filling of ""angel hair"" pumpkin jam) and the rosquillón (a ring-shaped cake). The dolmens in Encinas Borrachas and Montero attest to the presence of prehistoric men in Alpandeire, and to the important role of the area as a corridor connecting the depression of Ronda and the Genal valley. Pottery and ruins in Vasija and La Mimbre suggest that the Romans could have settled in this area of Serranía de Ronda for some time. The village of Alpandeire was founded by the Arabs in 711, just after the Muslim expansion across the Iberian Peninsula. In 1485, during the Reconquista, the powerful Muslim leader Ahmed al-Zegri was arrested by the soldiers of King Ferdinand the Catholic. He was in Alpandeire levying troops to fight off the Castilian army. In the hands of the Christians, the village entered a stage of decay, which worsened when the Moors were expelled from Spain. King Philip III ordered the area to be repopulated as soon as possible. New residents (as many as 22) came to settle in Alpandeire and the neighbouring village of Pospitar. They were given lands and houses to live in. The recent history of Alpandeire is tied to the fate of Francisco Tomás de San Juan Bautista Márquez Sánchez, aka Fray Leopoldo from Alpandeire. Born on 24 June 1866, at 33 he left his life behind and moved to Granada to join the Order of Capuchin Friars Minor. From then until his death in 1956, Fray Leopoldo spent his life helping the needy. Word of him spread through Andalusia, earning him followers and devotees among the people. Soon enough, favours and miracles were attributed to him. Fray Leopoldo from Alpandeire was beatified in 2010 in Solemn Mass held on behalf of Pope Benedict XVI. The ceremony was attended by dozens of thousands of people.